The First Victory in the Trial the Network vs. AbbVie! It was the first victory of the Network of PLWH in the case versus monopoly patents of the pharmaceutical company AbbVie! On October 4, 2017, the court satisfied patients’ request and approved an examination of the patent for the HIV drug Aluvia. In Ukraine, for thirteen years, a manufacturing company has maintained a monopoly on the drug that patients receive at a price of an innovative one. Meanwhile, generic versions of more modern drugs at a lower price are already available in the world. 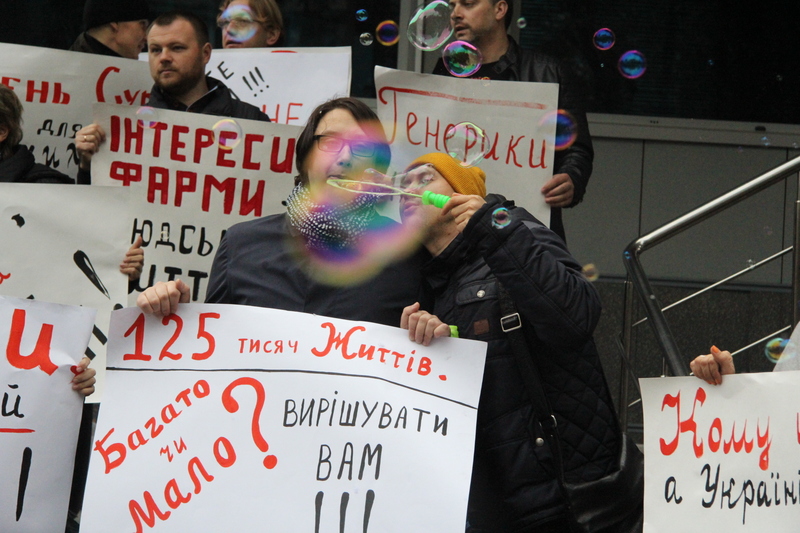 On October 4, 2017, patients appealed to judges one more time to stop inflating a giant soap bubble and take sides with 125 000 people with HIV, whose lives depend on their decision. The activists held the “Groundhog Day” action, blowing millions of soap bubbles near the court as they did two weeks ago. The next step is to choose an independent expert who will determine if the monopoly on this drug complies with the laws of Ukraine. “There is no reason to make us stop. Our next goal is to ensure that the expertise which the court approved will be objective and independent,” said Serhiy Dmitriev, the Advocacy and Policy Director of the Network. Because of formal patents, cheaper analogues of HIV drugs can not enter the Ukrainian market and, therefore, 125 000 Ukrainians can not receive treatment. 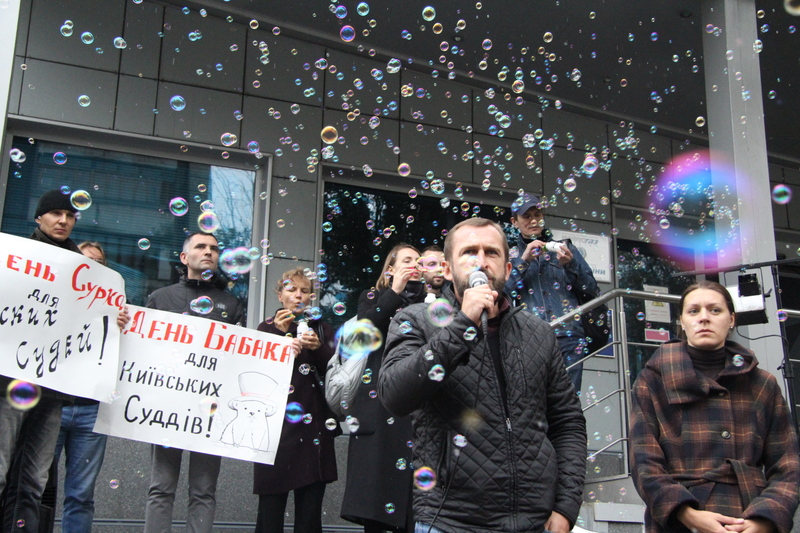 On the case: On May 31, 2016, the All-Ukrainian Network of People Living with HIV/AIDS filed a lawsuit in the Kyiv Economic Court of Appeal to hold the patent for lopinavir/ritonavir (Aluvia) invalid. The claims of the Network of PLHA are based on the following: the disputed patents do not meet the requirements of the legislation on novelty and inventive level, and the legal monopoly of the company-patent holder (AbbVie Inc., USA) allows it to overprice the drug. As a result, the state and donors are currently spending $ 19 500 000 yearly to buy only the lopinavir/ritonavir, providing 26 000 HIV patients. In case of the patents cancellation, it will be possible to buy this drug at three times lower price spending $ 6 million per year. This will potentially allow free treatment for 125 000 more patients with HIV. On March 6, 2017, the Kyiv Economic Court of Appeal dismissed the lawsuit even without scheduling examination of patents compliance with the requirements of the legislation. Reasons for dismissal are as follow: the disputed patents do not violate the rights or the interests protected by law of the plaintiff as a patient organization and, according to judges’ opinion; it is not proved that in the case of patents cancellation the price of the drug will be reduced. These reasons for dismissal are completely unjustified and controversial from a legal point of view. On May 11, 2017, the first session of the Kyiv Economic Court of Appeal caused a great public interest due to its importance for the public health of Ukraine. Representatives of the pharmaceutical company did not appear in court, but they submitted a written request for postponement of legal proceedings until 6 months. Suddenly, the court panel decided to satisfy the defendant’s request and postpone the trial until six months, i.e., until November 16. The Network of PLWH has appealed the Kyiv Economic Court of Appeal against such an unreasonably long postponement of the case proceedings. The court took patients’ side and revoked the decision of the Court of Appeal to postpone the consideration of the case until six months. The new hearing was scheduled for September19.